moghimi, J., Alebooyeh, N., Hasani, A., Ghorbani, R., Taheri, G. (2018). Periodontitis and rheumatoid arthritis: A neglected association in developing countries. 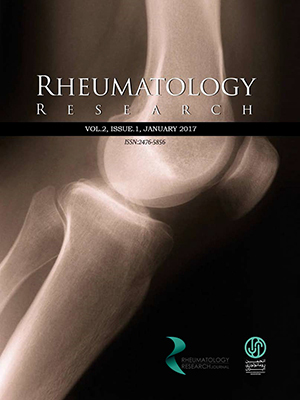 Rheumatology Research, (), -. jamileh moghimi; Nasibeh Alebooyeh; Amir Hasani; Raheb Ghorbani; Golmehr Taheri. "Periodontitis and rheumatoid arthritis: A neglected association in developing countries". Rheumatology Research, , , 2018, -. moghimi, J., Alebooyeh, N., Hasani, A., Ghorbani, R., Taheri, G. (2018). 'Periodontitis and rheumatoid arthritis: A neglected association in developing countries', Rheumatology Research, (), pp. -. moghimi, J., Alebooyeh, N., Hasani, A., Ghorbani, R., Taheri, G. Periodontitis and rheumatoid arthritis: A neglected association in developing countries. Rheumatology Research, 2018; (): -. This study investigated the effects of periodontal therapy on disease activity in RA patients. Materials and Methods: In this before and after clinical trial study, 30 patients with simultaneous RA and periodontitis, from March 2014 to February 2016 were selected. Disease activity score with 28 joint counts (DAS28) questionnaires were completed. Patients with confirmed periodontitis received non-surgical scaling, root planning, systemic antibiotics and chlorhexidine. At days 45 and 90 after treatment, the DAS28, erythrocyte sedimentation rate (ESR) and C-reactive protein (CRP) was measured again. Paired t or Wilcoxon tests were used to compare the differences between baseline and in days 45 and 90 after periodontal therapy within the same group.